It's in 1928, that Kamal makes us run across Daniel for the first time. As a sprightly young man, with stars writ large in his eyes, he lands up at the Hindustan Film Company, to meet up with Dadasaheb Phalke, the legendary producer-director-screenwriter, known as the father of Indian cinema. A much too busy Phalke is able to offer him little support, but does grant him an opportunity to watch him direct a film! What we call the beginning is often the end. And to make an end is to make a beginning. The end is where we start from. Beautifully put together by T S Eliot, these words seem suggestive of the life of an artist who deserved to be a part of cinematic history, but who almost didn't. Kamal, through his latest film 'Celluloid' , in true filmic fashion, attempts to the narrate the tragic tale of Joseph Chellayya Daniel Nadar (Prithviraj), the first ever film maker in Kerala, who was destined to perish in desolation and obscurity. Attended to, only by his frail old wife Janet (Mamta Mohandas), Daniel watched his life flicker feebly away in a dusty old house at Agastheeswaram, far away from his homeland. Daniel travels back to Kerala a changed man, and confesses to his wife, that his dreams of making the first motion picture ever in Kerala is bound to run into several hurdles. But it's only when you see a thousand dreams, that a few of them are realized. Janet, who hasn't yet gotten over the mesmerizing experience of having watched Chaplin's 'The Kid' at the Capitol Theatre agrees wholeheartedly with her husband. Setting up an office at Sarada Vilasom at Pattom in Trivandrum, under the name of Travancore National Pictures, Daniel and Janet bring in the shoot equipments in no time. Aided by Sundararajan (Sreejith Ravi) and a theatre artist Johnson, Daniel gets ready with the script of his first and only film 'Vigathakumaran' and sets out on the search for a heroine. It's at Mumbai that he is introduced to Lana (Sruthi Dileep), an Anglo Indian film actress, who very reluctantly agrees to be a part of his film when she realizes with a shock that Daniel has a social drama in mind, which is a far cry from the mythological that she has been acting in. Unable to put up with Lana's demands, Daniel continues his search for a woman to play the female lead in his film. Rosamma (Chandni), a Pulaya girl who has been acting in Kakarassi dramas is spotted by the crew, and Daniel is overjoyed when her dad agrees to let her act in his film. Rechristened as P K Rosie, she walks on to the Malayalam cinematic timeline ever so fleetingly, only to disappear without a trace. What interested me more in this film on Daniel, is this dusky woman who inadvertently led a cultural revolution in the state, with her decision to give the cinematic medium a try. She shudders at the thought of playing a Nair woman named Sarojini and is reassured by Daniel that untouchability is non-existent in the world of films. Bedecked in gold ornaments and clad in traditional mundu pudava, the young girl discovers a new life and identity every time her director shouts out 'Action'. The screenings of 'Vigathakumaran' were stalled as orthodox viewers staged a protest against an untouchable woman playing an upper caste woman. Chased off her roots for having committed the unthinkable offence, Rosie scampered away into the darkness of a night, never to resurface again. Her sudden vanishing into the shadows is dreadful, in that unlike Daniel, she was never seen or heard of again. Daniel, who resigns to the comfortable life of a dental surgeon at Agastheeswaram, is discovered years later by Chelangatt Gopalakrishnan (Sreenivasan), who runs from pillar to post to see to it that the man is honored. Regrettably, its only year later, when Daniel had long passed away, that Kerala's first ever film maker is recognized by the state. 'Celluloid' does end up a bit shaky after the entrance of Gopalakrishnan, and introduces real life characters as Vayalar Rama Verma and Harris Daniel to lend further authenticity to what it's trying to put across. The character development is almost complete in 'Celluloid', and I say almost since it cannot afford to fill up the cracks that exist in real. It's as much the story of Daniel, as it is of Rosie, and their haunting portrait seizes you up, even as it goes up in flames. Any comparisons to 'Harishchandrachi Factory' are odious; the two films barring the fact that they talk about the struggles of a film maker, are as different from each other as chalk and cheese. 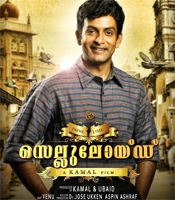 It isn't really surprising that Prithviraj makes a convincing Daniel. The vision of the film maker remains safe with him, and he captures the psychological turmoil that Daniel goes through in the later years of his life with great competence. Mamta is impressive as well, though its new find Chandni who is the scene stealer in the film. The innocence that spurts out of the corner of her lips as they stretch into a hesitant smile defines the person that Rosie must have been; unimaginably daring and yet immensely terrified. Venu's frames maintain the elegance that is required of a biopic, while Suresh Kollam's art direction is top notch. Pattanam Rasheed'a makeup makes Daniel's transformation complete, and M Jayachandran's melodies add up to the retro feel of the film. What is astonishing is that Kamal's film, despite maintaining a distance from us with regard to time and space, continues to fascinate us in multiple ways. Passionate, provocative and real heartrending, this is the stuff with which classic films are made.